Below is a brief introduction to the three major subtypes of Narcissistic Personality Disorder and some examples that illustrate how they might act on a first date with someone new. How they act on that date can provide useful information on how they would be in an ongoing intimate relationship, should one develop after that date. The difference is that on a first date, they are putting their best foot forward. If you do not like their behavior then, you are even less likely to enjoy their company later on when they are taking you for granted and not trying so hard. 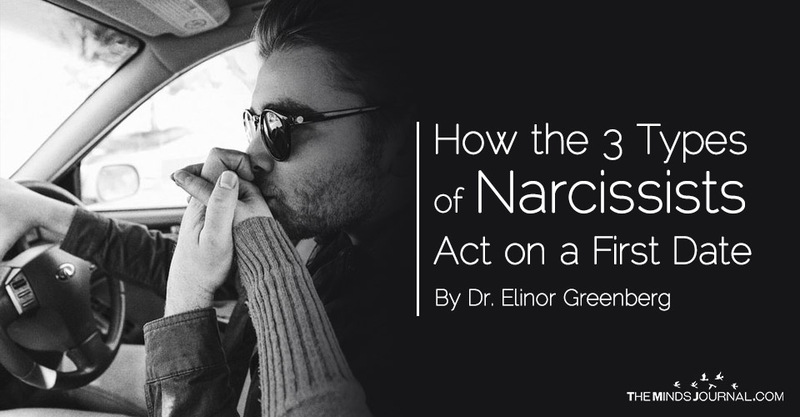 Narcissists are usually fairly overt when it comes to demonstrating their relationship style because they are not usually aware of what their actions say about them. They also tend to repeat the same relationship patterns over and over again. You are usually safe assuming that: If they do it with you on a first date, they have done it before, and will do it again. The “GOD Defense” is my shorthand way of describing the defensive, unrealistically perfect facade that Exhibitionist Narcissists attempt to construct to hide their own self-doubt. Instead of presenting themselves as normal human beings with assorted talents and flaws, they insist that they are special, perfect, know everything, and are always right. They also expect everyone around them to agree with their point of view. In their mind, they are “above” and everyone except a select few are “below” them. Because this arrogant posture is a thin, easily pierced façade and not how they really feel inside, it is easily disrupted. This makes Exhibitionist Narcissists hypersensitive to even minor slights. They are quick to get angry and ready to fight over things that most people might not even notice. They can also be quite cruel because they lack emotional empathy. Ted, an Exhibitionist Narcissist businessman, went on a first date with an attractive woman Sue whom he met through an Internet dating site.